You are here: Home / About People / Angelina Jolie – What Would You Pay? A Chinese investment fund manager, Zhao Danyang, bid 2.1 million on eBay to have lunch with Warren Buffett and get stock market advice from him. Very shocking news indeed; even to Warren Buffett! This got me thinking; what is the fair-value of a lunch? Most of us would be happy to get a free lunch, so our fair-value is about $15. But what about a famous and attractive woman like Angelina Jolie. Would that same fund manager pay 2.1 million to have lunch with Angelina Jolie? And if not, how much would someone else pay? To answer this question we turn to the economic laws of demand and supply. 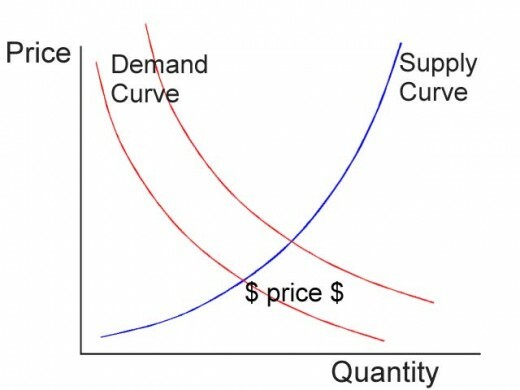 The greater the demand (a shift of the red demand curve to the right), the higher the price (the point of intersection between the demand and supply curves). From a demand or popularity standpoint, Angelina Jolie is more widely known. Demand and Supply Chart. Greater popularity, causes the demand curve to shift to the right and results in a higher price. Tom Cruise only gets 450,000. It is interesting to note that Barack Obama gets an average of 1.8 million searches; higher than Angelina Jolie. ** All popularity numbers were taken from Google AdWords, as of July 2008. The lower the supply (a shift of the supply curve to the left), the higher the price. Normal mortals do not have good access to Warren Buffett, Angelina Jolie, Britney Spears, or Barack Obama. So supply is limited in all those cases. 1. Number of substitutes: The more substitutes there are, the more elastic demand is. Because there are many celebrities, I am more willing to forgo lunch with Jolie, and instead go out for lunch with Eric Estrada, at a lower price. In contrast, there are no other fund managers with the same business savvy and magic touch as Buffett; so there are few, if any substitutes. This makes demand more inelastic and leads to a higher price. 2. % of purchaser’s budget: 2.1 million may seem like a large sum to us because our total assets may not even add up to 10% of that figure. On the other hand, 2.1 million is small change to Zhao Danyang’s net worth. Because Warren Buffett’s purchasers tend to be rich, they are willing to pay more for the privilege of having lunch with him. In contrast, Angelina Jolie fans, like you and me, have a lot less money, so our demand is more elastic. I.e. we are more willing to forgo lunch with Jolie. 3. Type of good: Necessities and emergency goods have more inelastic demand than luxury goods. Having lunch with a celebrity, whether it be Angelina Jolie or Warren Buffett, I think, qualifies as a luxury good. Demand therefore is more elastic. 4. Time until purchase: Does the buyer need to have lunch as soon as possible, or is there no hurry. Zhao Danyang probably wants investment advice from Buffett as soon as possible. In this way, he stands to make more money sooner, while making fewer bad investments. Having lunch with Angelina Jolie is probably less time critical. All this shows that demand for Angelina Jolie is a lot more elastic (flexible) than demand for Warren Buffett. 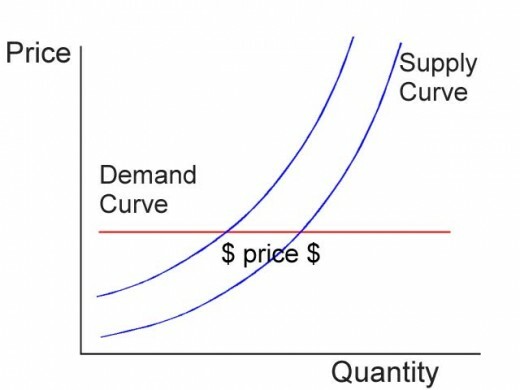 Elastic demand results in a flatter demand curve (see chart), which means that price will not change much even to significant changes in demand and/or supply. Perfectly Elastic Demand Curve. Elastic demand (flexible demand) results in a flatter demand curve, which means that price will not change much even to significant changes in demand and supply. What would you pay for Angelina Jolie? What would one pay to have lunch with Angelina Jolie? Probably a lot less then 2.1 million. Even though there is greater demand (popularity) for Angelina Jolie, her demand is a lot more elastic. I want to end by considering how much we would pay to have lunch with a loved-one. In this case, demand is high, and inelastic, however, supply is also high (you generally have good access to your loved one). However, if you were to suddenly lose access, price would go up significantly. When you go home tonight, take some time and show your loved ones how much you appreciate them. Just because you have access, does not mean you should take them for granted.